The Ernest J Gaines Center at UL Lafayette will present the première of “An Obsession of Mine”: The Legacy of Ernest J. Gaines on Nov. 15, 2009, at a reception from 2 to 4 p.m. at Edith Garland Dupré Library. “ An Obsession of Mine” is a short documentary film that examines key autobiographical influences in the work of one of America’s most important living authors. Part of a larger work-in-progress, the film focuses on what Gaines describes as his chief “obsession” of the last few years: preserving the community cemetery where his ancestors and others who inspired his artistic vision have been buried since the time of slavery. It comments as well on the importance of preserving the papers of an acclaimed writer and supporting scholarship on his works. The film was written and directed by Charles Richard and Joe Sanford and produced by Marcia Gaudet, Charles Richard, and Joe Sanford. The film features interviews with Ernest Gaines and two prominent Gaines scholars, John Callahan of Lewis & Clark College and Rudolph Byrd of Emory University. It also features readings by Marcus Lyle Brown, narration by Darla Montgomery, and music by David Greeley. The production was filmed in high definition by Pelican Pictures, and it includes beautiful images of the landscape of the False River area, the fictional setting of Gaines’s work. The reception will also feature “This Louisiana Thing That Drives Me”: The Legacy of Ernest J. Gaines, a new coffee table type book published by UL Lafayette Press. Called a “gorgeous book” by Times-Picayune Book Editor Susan Larson, this publication uses photographs and quotations from Gaines’s fiction and essays to create a narrative of the land and people who inspired him, the literature he produced, and his ongoing legacy. There are 30 black and white photos, including archival photographs from the 1930s and photographs taken by Gaines in the 1960s, as well as 50 color photographs. The book includes an introduction by Gaines, an original poem by Wendell Berry, and short essays by authors Reggie Scott Young, Marcia Gaudet, and Wiley Cash. All royalties from the book will go to the Ernest J Gaines Center. The 2010 Ernest J Gaines Center calendar will also be on sale at the event. This full color calendar features photographs of Gaines and the landscape that inspired his literature. It includes photographs by award-winning photographers Philip Gould and Terri Fensel of Lafayette, David Humphreys and Thomas Neff of Baton Rouge, and Joe Sanford of Covington. The photographs are accompanied by quotations from Gaines’s fiction, essays, and interviews. All royalties from the calendar will go to the Gaines Center. Writer-in-Residence Emeritus Ernest J. Gaines and his wife, Dianne S. Gaines, have generously donated all of his author’s papers and manuscripts, as well as selected awards and artifacts to UL Lafayette. The Ernest J. Gaines Center, now under construction in Edith Garland Dupré Library, was established in 2008 to house, preserve, protect and utilize the Gaines collection, and to foster research, scholarship, and programs on his work. The Gaines Center will be an international center for scholarship on Ernest Gaines and his work. In addition to the university’s contributions and support, activities of the center will also depend on philanthropic contributions. As guardian of his legacy, the center has initiated a fundraising campaign to establish a $4,000,000 endowment to support the activities of the center. The first 100 contributors of $5,000 or more to the Gaines Center will be designated as Founding Patrons. They will receive a copy of a special limited edition of the book This Louisiana Thing That Drives Me: The Legacy of Ernest J. Gaines. These limited edition books will be numbered and signed by Gaines and the authors. Tax-deductible contributions to the Gaines Center can be made online at http://ullafayettefoundation.org. 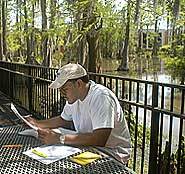 Contributions can also be sent to the UL Lafayette Foundation at P. O. Box 44290, Lafayette, LA 70504, designated for the Ernest J Gaines Center. For more information about the Ernest J. Gaines Center, please contact Dean of Libraries Charles W. Triche at 337-482-6396 or Gaines Center Director Marcia Gaudet at 337-482-5486 or by e-mail at ejgc@louisiana.edu.